This week, I finished my Hermione’s Everyday Socks and I love them! Here’s the Ravelry link to my project. Not completely certain why they are so washed out in the pictures – crappy camera phone, I’m sure. I love this yarn, Nooch Fiber Midtown Sock in Leda and the Swan. It is so super squishy and soft and is such a lovely sourvenir of when I was in NYC. 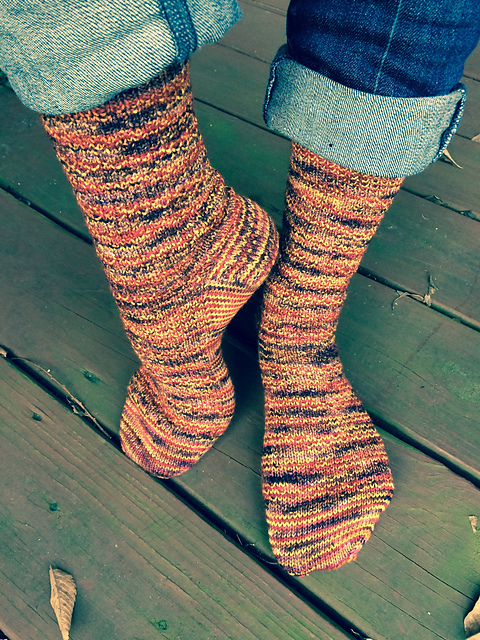 I was nervous about the strong variegation in the yarn but this pattern, Herminone’s Everyday Socks by Erica Lueda, a free Rav download- yay! – has been perfect with this yarn. 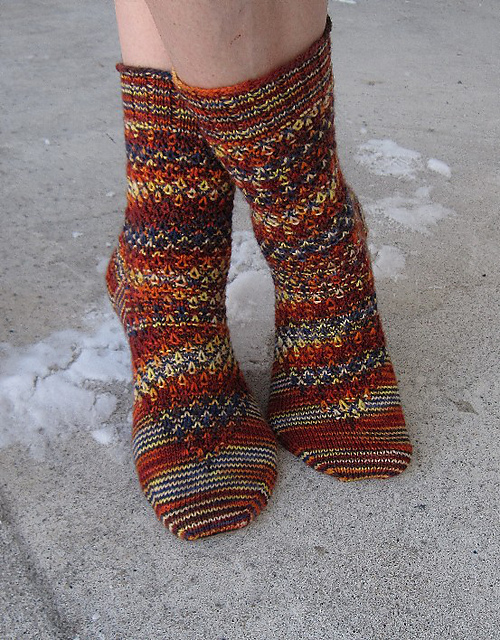 The sock fits really well and I particularly love the toe shaping on this project. Sometimes the toes look kinda pointy and a little odd, although they always look fine on the foot, but this toe looked like a proper toe without pointy weirdness. Would absolutely recommend as an easy, travel-worthy, pattern that works particularly well with heavily variegated yarn. Will absolutely make this again. And can I take a moment here to thank all the amazing pattern designers who are kind enough to produce amazing patterns, like this one, and make them available for free online? I just love the Ravelry community and especially love that there are so many generous people willing to share their talents with the rest of us. One day I hope to be able to contribute more in my own way. On to the next project. Have started my next pair of socks already using Cephalapod Yarns’ Skinny Bugga! 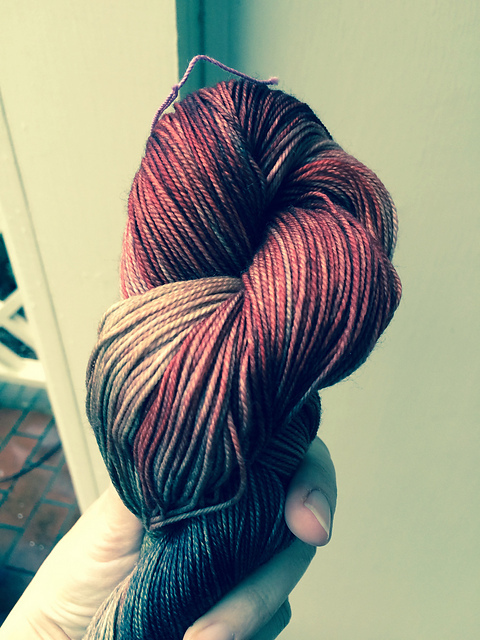 in Vampire Squid colourway. 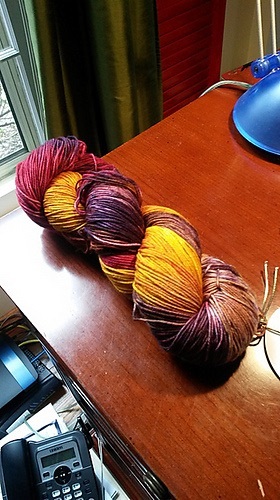 Love that name, Cephalapod Yarns in Vampire Squid. Is it wrong to buy a yarn because of its name? Wouldn’t have quite the same … je ne sais quoi… if it were called Grey and Red #3. Fabulous marketing, guys! Cephalapod Yarns Skinny Bugga! in Vampire Squid colourway. Am using a new-to-me pattern called Harvest Dew by Rose Hiver. The wonderful, generous, folk on Raverly recommended it as being particularly awesome when using, again, heavily variegated yarn as the slipped stitch helps to break up the flashing. I think these socks are going to be amazing. Rose Hiver’s Harvest Dew. Fabulous! So much fun to have a new project! Are you knitting socks, too? What are you working on? 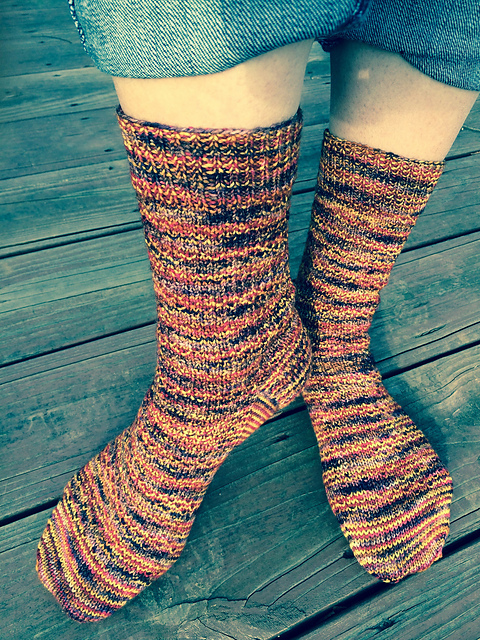 Harvest Dew, Hermione's Everyday Socks, knitting, what are you knitting? Thanks! They feel great on, too. Homemade socks are such a complete luxury, don’t you think?